Being an American, we are use to driving long distances as compared to most Europeans. When you realize that the entire continent of Europe can fit into the lower 48 states of the US, you can start to understand why. Also, in Europe, the train (rail) service is fantastic, and most towns and cities are serviced by train. 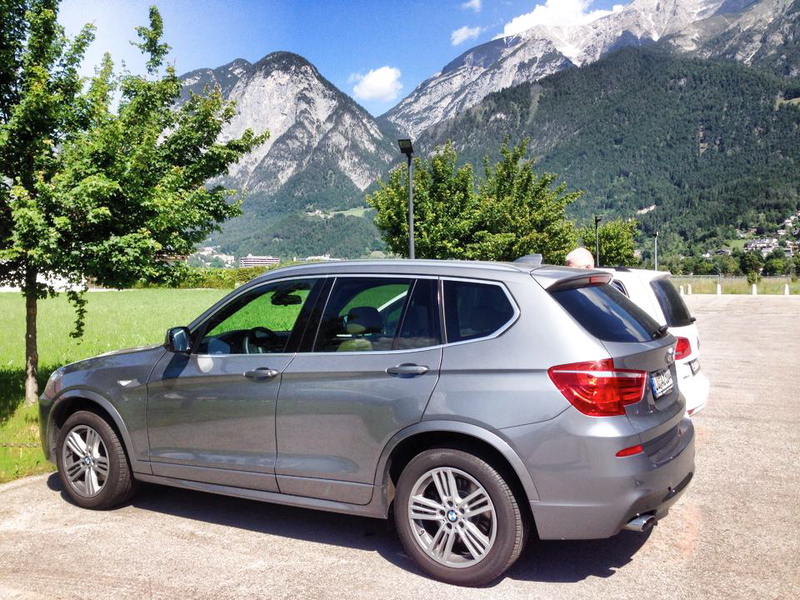 But, being an American, and given the fact that we own a 2013 BMW X3 and can drive on some very nice roadways, when my parents and sister visited us in June, 2014, I planned to take them to Venice. 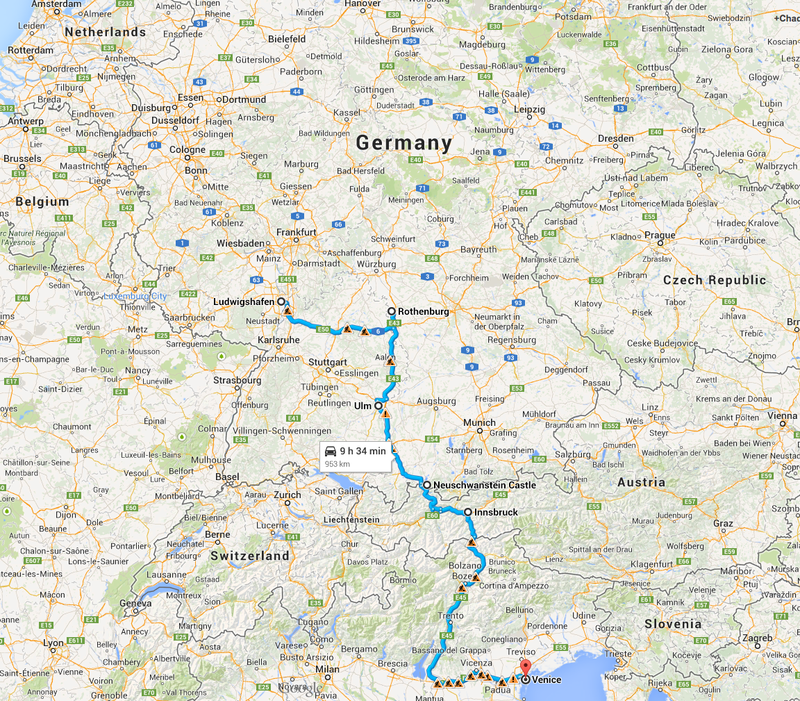 I decided that for the trip from our place in Ludwigshafen, Germany to Venice, Italy, that we were going to drive there!! According to Google Maps, driving straight through is about a 9 hour trip. So, if we wanted to, we could have driven straight through. 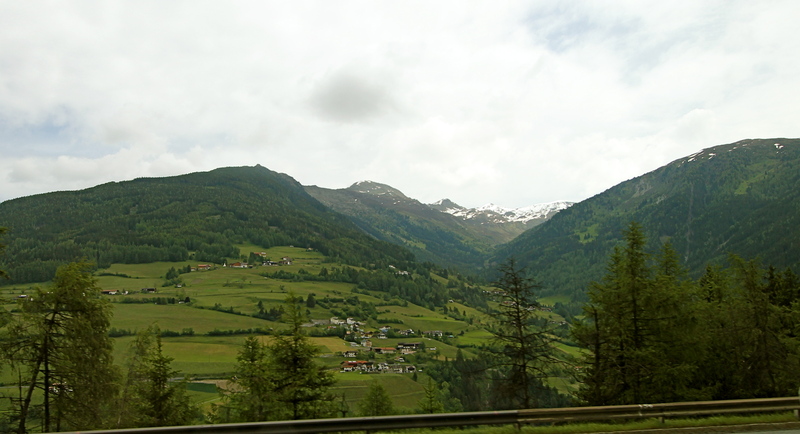 However, I planned destinations and overnight stops along the way, so the longest “drive” was going to be a 4-hour drive between Innsbruck, Austria to Venice, Italy. Our car parked in Innsbruck, Austria. Once I had all of the destinations mapped out and hotel reservations made, I am SOOO GLAD that I Googled, about driving through the Alps. I am especially happy that I learned that before entering Austria, you must buy a Vignitte (toll window sticker) from one of dozens of available gas stations. You basically buy a 10-day Vignitte for 8,50 Euro and this the toll during this timeframe. If you do not buy this, and are stopped by the Police, you must pay a 200 Euro fine on the spot! That can become a VERY expensive drive!! 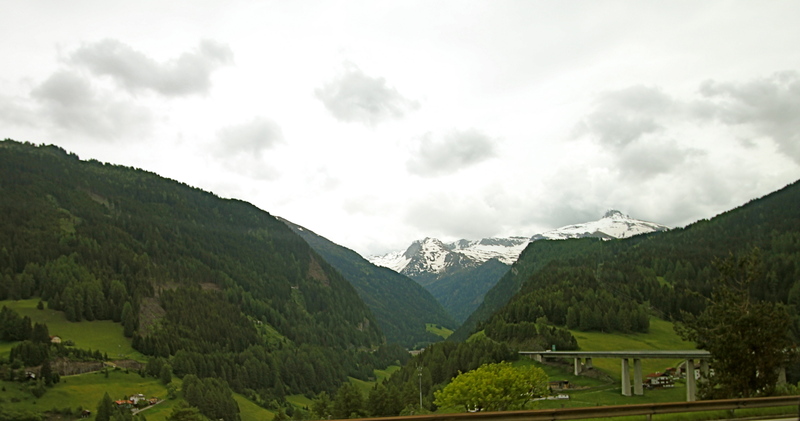 The only other tolls we encountered in Austria were when we passed the Brenner Pass, which is the crossing over one of the ranges in the Alps. This toll was another 8,50 Euro. The toll system in Italy is much like tolls that I have seen in Illinois, New York, and Florida, where you pull into the toll booth, press the button, and receive a ticket. Then, when you get off the toll road, is when you pay. The toll cost is something like 7 Euro per 100 kilometers traveled, and the total cost of our toll from entering Italy to arriving in Venice was about 25 Euro (one way). Living in Germany, I absolutely love driving on the autobahn, which is the German system of connected interstate highways. For the most part, the roads are in excellent conditions. And, the best part, is when you are not traveling near construction sites or connecting highways, the speed limit is “No Limit”. And, you want to talk about flying….the BMW can haul arse!! The fastest I traveled with my family was 210 km/hour (130 mph). 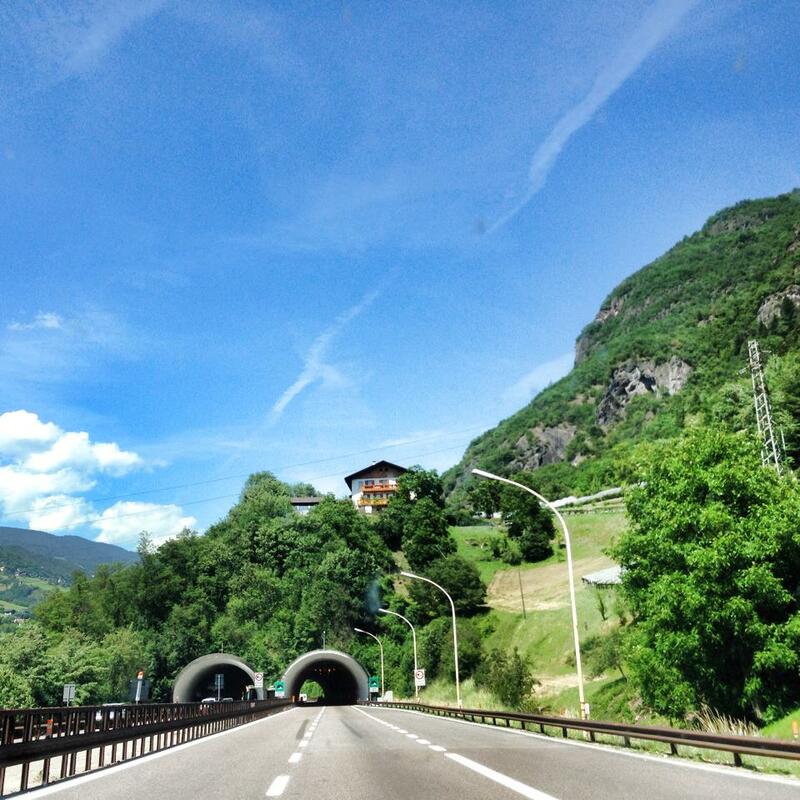 But, once you get to Austria and continuing into Italy, the maximum speed limit is 130 km/hour (80 mph). 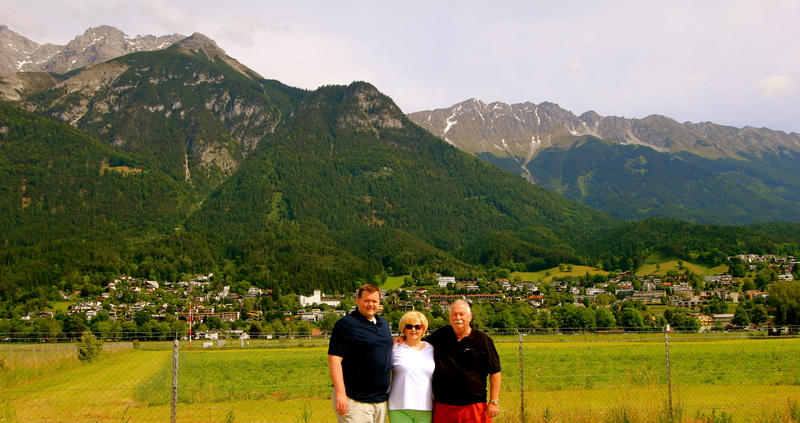 After we left the Neuschwanstein Castle area, we drove about 90 minutes into Austria to stay the night in Innsbruck. After driving past the highest mountain in Germany the Zugspitze, we drove down into this wide valley area into Innbruck. Not only the first time my parents had been outside of the US, but the first time seeing mountains taller than 6800 feet (the Appalachian Mountains in the eastern US). 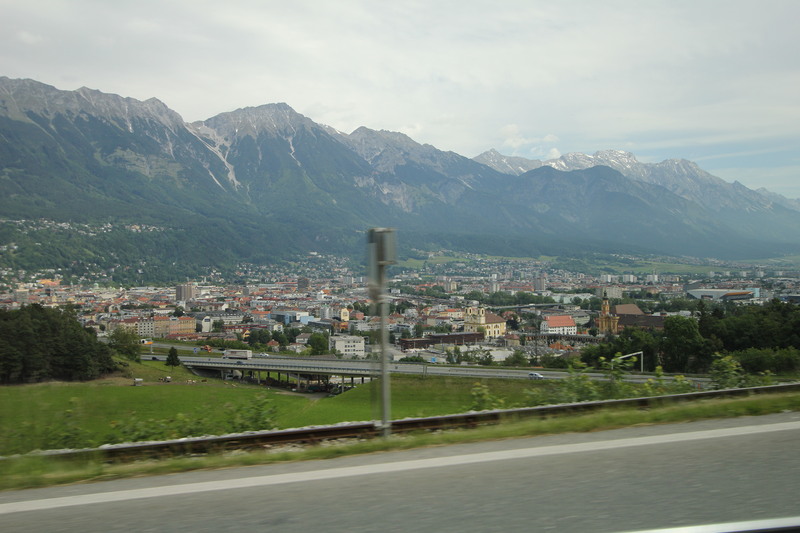 Before starting our drive to Italy, the hotel in Innsbruck, Austria was next to the airport. I found the drive itself to be rather easy. 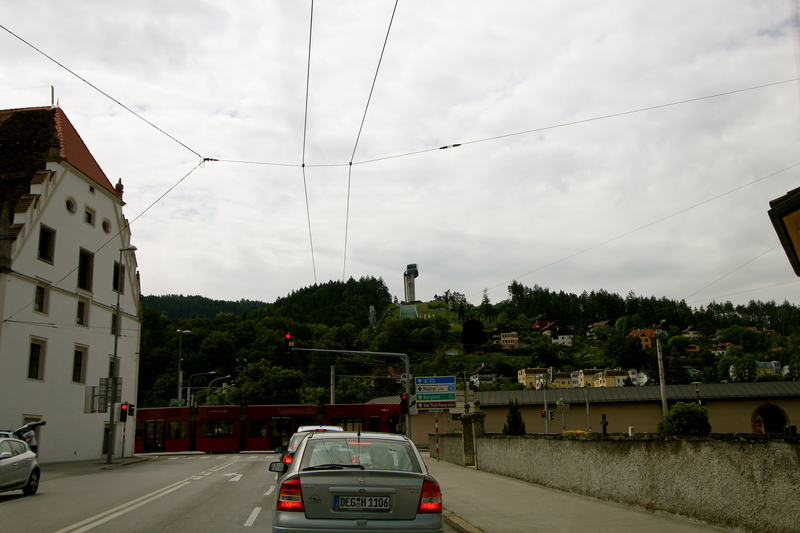 Being the German or Austrian autobahn, or on the Italian autostrada, there are many places to stop for gas or food. Some places have small restaurants beside the gas stations, or sometimes inside. And, for those that have not driven in Europe, most public restrooms have a small cost to use. The majority of them cost from 50 Euro cent to 1 Euro. You pay, and then get a small coupon to use in the store. So, in reality, “to go” costs a few cents, so that is why it is good idea that when driving to carry with you several Euros worth of coins. As far as fueling up, in Germany & Austria, the gas stations are self-service, but in Italy, there is an attendant that pumps the gas for you. Everyone I met in the area of getting gas could understand the basic English words associated with “filling up” and “pay with credit card or cash”. Also, be aware of the fuel type your car uses, especially if it is a rental car. Our BMW requires diesel, so be sure to pump this or instruct the attendant properly. 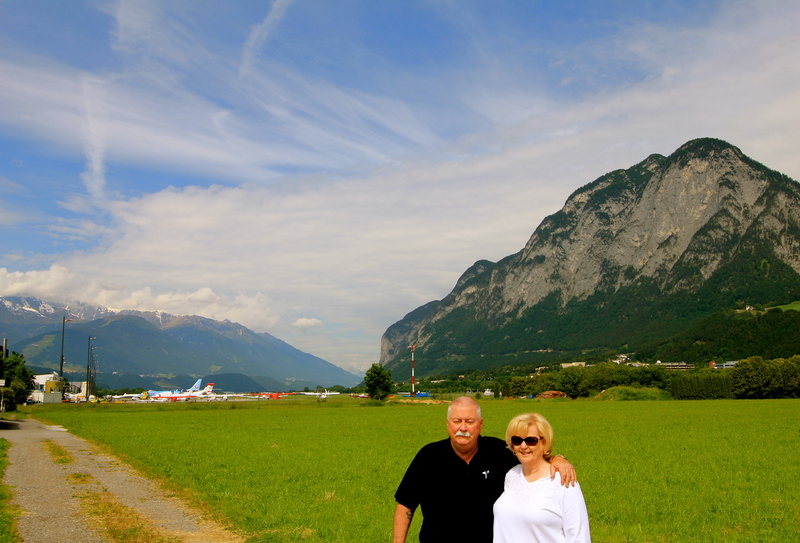 Now to the scenery…..the Alps are stunning!! Driving south in Germany, you quickly enter into the Alps, and the mountains continue to get higher and higher the further into Austria you travel. Most of the autobahns & autostradas were built along trading routes already established in valleys between the mountains. So, you drive along flat valley floors with 11,000 feet+ snow-capped mountains flanking either side of you. Along the drive, it is very neat to see small, picturesque villages positioned between mountains to protect them from the winter weather. Even in early June, we saw several mountains still covered in snow at the tops. The weather does change quickly though as one minute it was bright and sunny, the next, cloudy and windy. If driving here during the winter, some areas require snow chains and it is always a good idea to check the current weather before setting off on your drive. Pretty common to see small castles along the route. Back when these were trading routes, the castles were used as toll booths that people had to pay in order to continue on. If one did not pay, then they had to find alternate routes through the mountain passes. 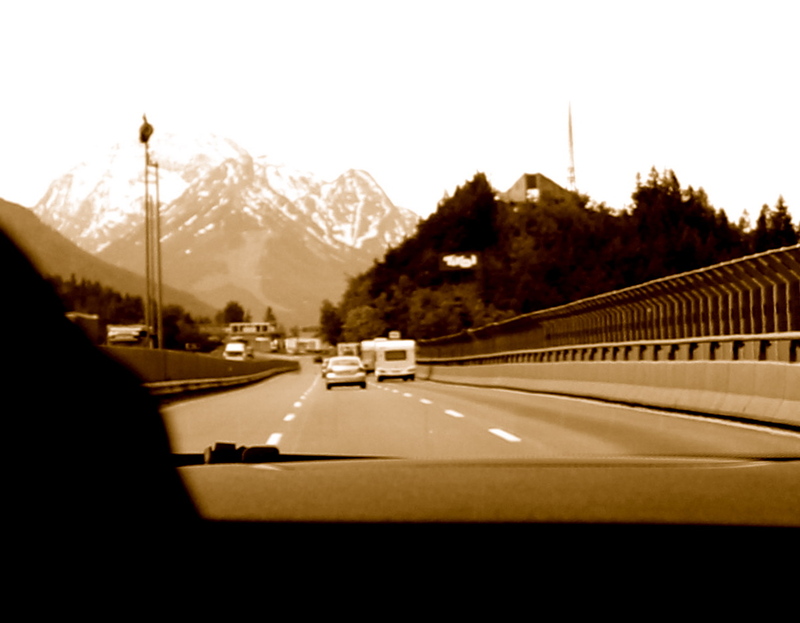 Ours was an easy, uneventful drive….the best kinds of drives there are. 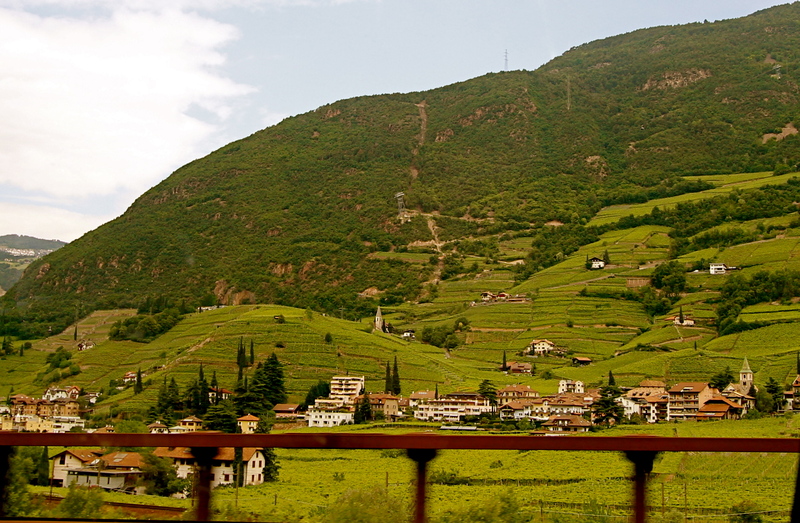 While I chose to drive a more direct route to get us to Venice, there are more scenic routes we could have taken. But, those scenic drives are better left to another time soon…..